One of the main issues facing watershed planners is how land use and management at the small scale is connected to the quality of watershed outflow. In most watersheds (especially in humid hill land watersheds), relatively small and well defined areas typically contribute much of the non point source water, sediment, and P and N exported in outflow. From a prediction, management, and control perspective, it is important to recognize and develop the concepts, modeling tools, and sampling pro tocols, in order to delineate and assess the impacts of these critical source areas. These are the highest priority areas for control, treatment, and remediation within the watershed (Figures 2 and 3). On the other hand, areas at lower elevation within the watershed, such as riparian buffer zones, receive all of the water and solid material based fluxes from the upper locations. 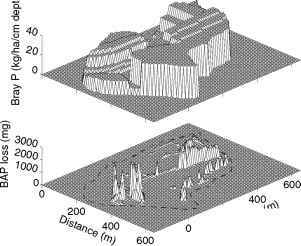 Thus the riparian areas are important sinks of material (Figure 1 ). Management and control decisions for P export must be developed within a storm based, source area frame work. This is because most P export originates from the relatively few larger storms and the relatively small cri tical source areas within the watershed. Soil P fertility, manure, and P fertilizer management should focus on these critical source areas, times, and storm sizes. Conversely, management and control decisions for N export depend more on balancing N use over the watershed. Nitrogen sources are more diffuse rather than concentrated in space, time, and by storm characteristics. The major exceptions are source areas where N use is excessive in terms of mass balance. 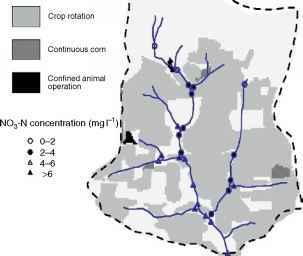 For our upland agri cultural watershed, the computed N imbalance provides a good measure of N export. Figure 2 Example of critical nitrogen source areas in agricultural catchments: nitrate source segments (baseflow) in the Brown subcatchment, Chesapeake Basin. Adapted from Pionke HB, Gburek WJ, and Sharpley AN (2000) Critical source area controls on water quality in an agricultural watershed located in the Chesapeake Basin. Ecological Engneering 14(4): 325-335. Figure 3 Example of critical phosphorus source areas in agricultural catchments: phosphorus (Bray P) concentration in soil and losses of biologically available phosphorus (BAP) from the Brown subcatchment, Chesapeake Basin. Adapted from Pionke HB, Gburek WJ, and Sharpley AN (2000) Critical source area controls on water quality in an agricultural watershed located in the Chesapeake Basin. Ecological Engneering 14(4): 325-335.
reduce surface runoff and P export by increasing infiltration may increase ground water and NO3 recharge. 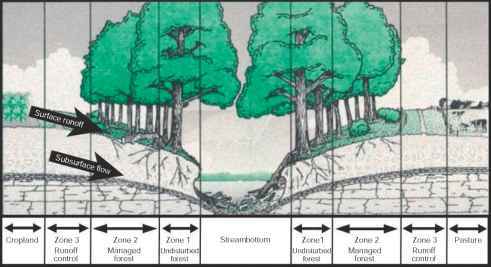 According to the river continuum concept, the headwaters of riverine systems are strongly influenced by the riparian zone. Therefore, the importance of riparian buffer zones is most important in the upper courses of streams. Also, controlling N and P export is the primary concern for upstream fresh waters and the freshwater arms of many catchments.